In 1982 Historian Jill Garrett took several photographs of “the old Mormon place” along the banks of the Duck River in Tennessee. It was part of an historic community called Shady Grove. The photographs which Mrs. Garrett took would be the last taken of the home of Abraham and Mary Church which was the center of the LDS missionary efforts in middle Tennessee for many years. In 1833, Abraham and Mary Church purchased 543 acres of land along the Duck River in middle Tennessee. On that site they built, or perhaps expanded, their new home. The design itself consisted of two almost separate structures with an open space between them called a dogtrot, which helped circulate the humid air. It was all covered by a shared roof which also provided a sheltered outdoor living area. Unlike other similar style homes, the dogtrot had a wooden floor and a second story running the length of the structure with rooms even above the dogtrot. The single roof created small but useful attic spaces above and on the rear side of the second story. Further outdoor living space was provided by a front porch running nearly the length of the home. There were other structures on the property too. There was a barn, a smoke house, stables, other unspecified out buildings and a cemetery. There were also slave quarters though no one bothered to mention them let alone describe them. Mormon history in Tennessee began in 1834 when David Patten and Warren Parrish preached along the lower Tennessee River. In June 1836, while escaping from a mob, the two reached safety in Hickman County. They proselytized there from late June to August in 1836 during which they met the Church family. Unfortunately neither missionary wrote about it. The Churches, however, happily told others about their brush with fame. The earliest written record comes from Parley P Pratt Jr., a missionary who preached in Shady Grove in 1878-79. Pratt wrote “The Gospel trumpet was first sounded in this place over 45 years ago by David Patten and Warren Parish and the people in the immediate vicinity for many years past have had many strong testimonies of the truth of the great Latter-day work.” As you might imagine this tale gained more details as the years passed. For example, latter versions recall Patten not for his preaching, but for his having gone hunting with the boys. Despite this early contact, none of the Church family were baptized in 1836. In fact, Shady Grove does not actually appear in LDS records for another five years. In 1840 or 1841, two unnamed missionaries arrived at the Church family home. They started their visit with a hymn. The oldest son, twenty-three year old Haden Church, said that just from the song they sang, he knew they were telling the truth. He dropped everything and went to Nauvoo to meet the prophet. There, Haden was baptized in the Mississippi river by Joseph Smith on April 5th, 1841. Despite the hospitality, they accomplished little in Shady Grove. They expanded into nearby areas but eventually headed south where they would have more success in Alabama and Mississippi. While they were still in Tennessee Haden returned to Shady Grove frequently, often without his companion. After almost a year in Alabama, Haden again returned to his parents’ Shady Grove home. In July 1844, Haden Church was joined by Abraham O Smoot. A few days after his arrival Smoot heard rumors of the death of Joseph Smith, followed a few days later by confirmation letters. Smoot and Haden left Shady Grove together and returned to Nauvoo. According to folklore Abraham and up to three of his sons, Emmons, Robert, and Charles also made their way to Nauvoo where one or more of them were baptized. That’s another story that gets more details as it is retold. Haden did not stay in Nauvoo very long. He returned to Tennessee later the same year perhaps with the hope of converting those who had not yet joined the Church, but certainly with the intent of marrying a convert from Mississippi, Sarah Arterbury. After the wedding on December 17th 1844 they moved to Nauvoo the next year, before heading west to Utah. It was about then that the first Abraham’s other children joined the Church. His daughter, Christine Hoover, was baptized probably in 1844 by a companion of Haden’s named Benjamin Clapp. Late that year Christine and her husband had a son whom they named Joseph Smith Hoover. However, Christine and her husband - he was never baptized – chose not to gather with the saints as Haden and Sarah did. Emmons, one of the three sons who were perhaps baptized at Nauvoo, showed no interest in gathering. Robert, another rumored Nauvoo convert, had no interest either. A third son, Thomas was baptized sometime in March 1847, a date recognized in church records. Thomas also stayed in Tennessee until well after the Civil War. It was their father’s home around which they gathered to worship, though perhaps only when Haden returned on his frequent visits. There is no evidence outside folklore that Abraham Church was ever baptized Mormon. He did subscribe to the Times and Seasons in 1841. But that in and of itself does not indicate church membership. In 1851 Abraham died, passing the family home on to his son Robert. I have not been able to locate a will or another document showing how much land or property Abraham passed on to his children. I know that Robert inherited the house and some of the land on which it stood. From the 1850 census we know that Abraham valued his real property at $6,000 and that he owned 21 slaves. In the years just before the Civil War, contact with the LDS Church in Utah slowed considerably. Haden returned once more splitting his time between his own and his wife’s families. Though some were members of the LDS Church, none of them returned with Haden to Utah. Immediately after the war a few missionaries went back to the US South. One of the first places they went to was Shady Grove. Haden was there off and on between 1868 and 1870, and again in 1875. 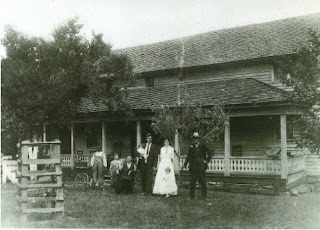 As before the visits were centered on the Church family home. Robert, now called Uncle Robbins, was the head of the house. He and his wife were as gracious hosts as his parents were before them. The rest of the family embraced the LDS Church as well. Haden’s brother, Charles and his wife Dolly found the time and resources to travel to Utah in 1872 for the sole purpose of receiving their temple work. Haden Church’s remaining siblings were baptized in or before 1875. Haden was frequently sick while on his missions. His final one in 1875 was no exception. He spent the last few months of his life suffering from what was probably typhoid fever. After Haden’s death, his companion Henry Boyle explained in a letter to Brigham Young “[t]here are five brothers and three sisters of the deceased all living near here, all members of the Church, and who did all in their power to bestow upon him all the care and attention that his case required” The family buried Haden in the cemetery beside the home near the grave of his parents. After the death of Haden Church, his family continued to offer sustenance to the visiting missionaries. Many used it as a base, striking out to nearby venues to preach. Other branches opened up within few miles. In addition to Shady Grove, there were organized LDS congregations meeting at Totty’s Bend and Love’s Branch, with smaller informal groups nearby. More branches were organized all over middle Tennessee. In 1881 the Tennessee conference split in two: East and West Tennessee, with Church family home in Shady Grove as headquarters of the west conference. Two years later there were 14 active, well-attended branches in the West Tennessee Conference. It prompted another split, creating the Northwest and Southwest Tennessee conferences. Members of the Shady Grove branch were faithful saints, but found alternatives to gathering. Emmons Church found the time and resources to go to Utah in 1877 to receive his temple work before returning to Tennessee. Charles Church and his second wife Sarah gathered to Colorado where their fourth child was born in 1881. Under the direction of John Morgan, Colorado had become a secondary gathering point for the Saints from the Southern States Mission. By 1884, however, Charles and family had returned to Tennessee. Key to their being able to return was the existence of a home and family at Shady Grove to which they could “ungather”. The Church family home was considered such a safe place, that missionaries who needed some convalescing time would travel to there simply to recover. One example is J. Golden Kimball. Suffering perhaps from malaria, Kimball left Chattanooga where he was working with B H Roberts, and took a train north to Nashville then another south to Columbia; a trip of over 180 miles. There he would have had to hire a wagon or walk, for the last fifteen miles. Kimball did not, however, get the chance to recover for long. On Aug 10th 1884, a mob killed two missionaries in nearby Cane Creek. Two other missionaries escaped the mob, though they were separated from each other. Each determined to head for the safety of the Church family home at Shady Grove. Meanwhile Elder Kimball heard rumors of the shooting and tried to investigate, once on the 11th and again on the 12th. Each time he met one of the escaping missionaries along the way and they headed back to Shady Grove, and relative safety. But the shooting death of Elders Gibbs and Berry would forever alter the role the home at Shady Grove could play. Upon hearing of the violence, Robert Church became severely ill. Descriptions of his condition are vague, describing initially fits of anxiety and incoherent ranting followed by a feverish calm. Later that week B H Roberts arrived at Shady Grove, intent on retrieving the bodies of the two slain missionaries. At the Church home he secreted himself in the smoke house to create a disguise. You can see him in his disguise in this relatively famous photo. He shaved his beard, exchanged his clothes for ones provided by various members of the Church family, including boots from one of the family servants. Using soot from the walls of the smoke house, he covered his pale skin. Roberts was able to successfully retrieve the bodies putting them on a train for Utah. After lingering for 10 days, Robert Church passed away. B H Roberts reported on the funeral to the Deseret News and so was likely there. Other missionaries were present and preached the funeral sermon. Robert was buried in the family cemetery next to his home. After the funeral the missionaries were fearful for their safety, even at the Church family home. The following morning, the entire contingent of the Northwest Tennessee Conference left for Nashville . Some went home, others were assigned to other areas in Tennessee. Robert and his wife Laura had no children. His verbal will left nearly everything to his brothers, George and Emmons, who were to make sure that his widow Laura was well taken care of. Laura’s share was 105 acres which represented one third of Robert’s real estate. The other two thirds went to George and Emmons. For reason we can only speculate, Laura sold the house two years later. With the removal of the missionaries, and the sale of their meeting place, the local branch struggled. Some members of the branch moved west to places as varied as Utah, Idaho, Colorado, and Texas. Many remained but few of their children stayed in the Church. Joseph Bond purchased the home in 1887 and lived there for twelve years until his death in 1899. It then passed to his daughter Ida Shelby who lived there until the 1950’s. The home, and the land under it, was purchased by a chemical company for the mineral rights on the accompanying land. In 1983 Sarah Cannon purchased just the home with the intent of moving it. Mrs. Cannon was well known at the time for her comedic persona Minnie Pearl. Her act included many self-deprecating jokes about the town in which she grew up; the fictitious Grinders Switch. There were, however, plans to make the town real. The hope was to create a tourist attraction; a place where devoted fans of Minnie Pearl could visit and experience a little bit of the southern culture of which the actress gently poked fun. To this end the Church family home was purchased and dismantled carefully. Each piece was labeled and moved to the site of the future park. The home was not the only building in the project. This one was moved intact. In 1991, however, Sarah Cannon suffered a stroke. The project was placed on hold. The pieces of the old home, logs, windows, doors, and foundation stones, were left exposed to the elements. Months turned into years and in 1996 Mrs. Cannon passed away. The project and the home that was meant to be a part of it were forgotten. Today the only reminder of the homestead is the cemetery. As it became obvious that the home would not be rebuilt, descendants of Abraham Church sometimes visited the disassembled home at Grinders Switch. More than one took a memento home with them. These were collected by a great great granddaughter of Abraham Church from debris of the home while it was at Grinders Switch. Hickman County later purchased the land at Grinders Switch for a new Agricultural Center and hired someone to clear away the debris. The contractor dumped what he hauled away on his farm. The fascination with the home, however, continues. In 2014 one descendant collected a few stones from that farm and passed them around to his cousins; including one stone which was mailed to Texas.